One of the best things you can do for your dog is to socialize him. Especially at an early age, get your dog out into the world and expose him to as many things as possible: children, adults, sights, sounds, places and other dogs (see Socializing Your Pit Bull). The important thing to remember when socializing your dog is not just that he sees and experiences things, but that he has positive experiences with these exposures. Lack of socialization can cause behavior issues for any type of dog. Also, don’t forget to spend lots of quality time with him. Training is key. The broken down teamship between dogs and humans causes untrained, unruly, and undersocialized dogs. Breeds have been blamed for the lack of training and leadership from humans. Training your dog helps to eliminate behavior issues that can arise. Take your dog to a training class for instance. Then continue with two- to five-minute sessions, 2-3 times a day. He can use his obedience skills to earn what he wants in life. For instance, have him sit and give you eye contact first, and then give him his dinner. Have him perform a down-stay to get the door open for a walk. This is a positive way to establish leadership with your dog as well. Be sure to spay/neuter your dog. 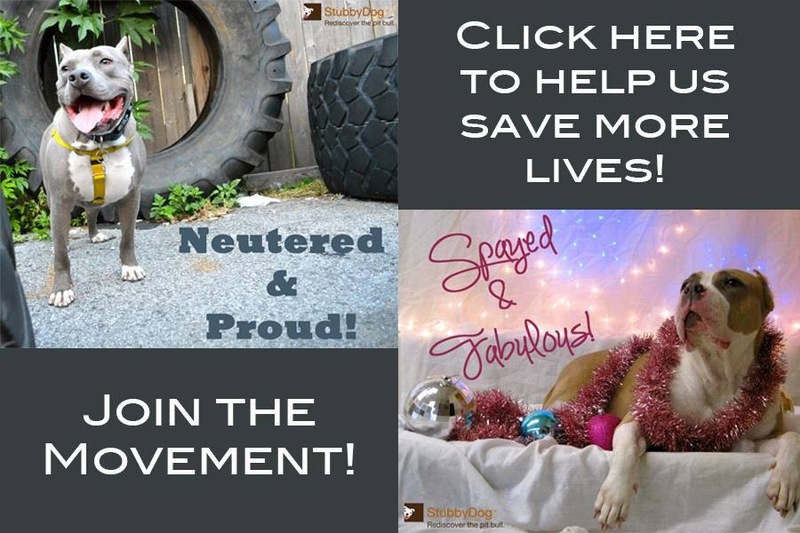 Spaying or neutering your dog will curb certain types of behavioral problems. This also eliminates homeless pets humanely. Dispel the hype. 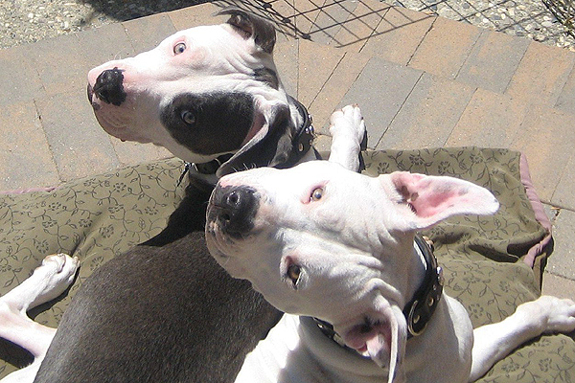 If you own a pit bull it’s possible you may encounter negative reactions to you and your dog. Try to be patient and understand the viewpoints of others due to wrong information or media hype. Our dogs are often judged based on how they look and not as individuals. The best way to handle this is to be pleasant and have a well-behaved dog. Show him in a positive, calm light. This will help dispel false fears and counter the media hype surrounding “pit bull” dogs at this time. Answer any questions they may have to help impart accurate info about the dogs. Set a good example with your dog. Clean up after your dog wherever you go. 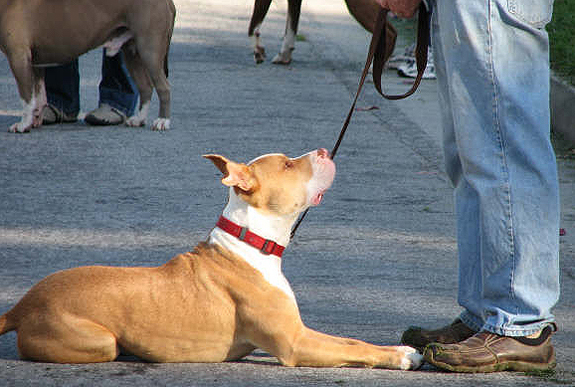 Keep your dog on leash in public, as it’s the law and safer all around. Help your dog become an ambassador by getting him involved with therapy work, agility or just plain ole’ fashioned obedience training to really show him off. 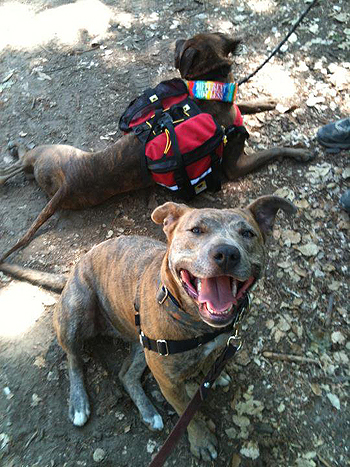 Our Pack can even help you get your Canine Good Citizen Certification. Provide license and ID. Providing licensing, microchipping and ID tags for your dog will reunite your dog with you quickly should he get lost. Make it easier for someone to locate you. Good management. Contain your dog. Don’t let your dog become a nuisance by allowing him to roam the neighborhood and expecting him to make “executive” decisions while out. Keep your dog inside if possible and not unattended in the backyard. Dogs can be stolen or someone can leave the back gate open etc, allowing your dog to get out. Inside, he’s safely contained and more comfortable. In the backyard while unattended your dog learns to chase squirrels at the fence, bark at passersby and become horribly bored and/or aroused. This can cause behavior issues and anxiety for your dog. Dogs without structure actually aren’t as happy. With good containment and structure your dog will actually feel safer, happier, more relaxed and will stay out of trouble. Provide medical care. Get regular check-ups for your dog. Establishing with a good vet will allow you to have or keep good medical records and be able to track his medical needs. Provide exercise for your dog such as walks or hikes. This also helps him stay healthy. In summary: You and your dog are a team. Your dog does need a team leader to help guide him to success, however. Training classes you choose should instruct ways for you to learn how to humanely guide your dog through life WITH you while strengthening the dog/human bond. With training, management, socialization and containment, life with your dog will be more fun, rewarding and fulfilling. Want to get the full scoop? Attend Pit Bull Basics, our comprehensive, people-only class to guide you through dog ownership and answer your questions about “pit bull” dogs today! Check out our Classes page for the latest dates & locations. Photos courtesy of Our Pack, Inc.
@skreidle Thanks, it’s fixed now. All great tips. Everyone who adopts a dog should receive a copy of this! @thatmutt Our Pack has wonderful info for anyone adopting any kind of dog.